Recently I traveled to Cuernavaca, Morelos, Mexico on a mission trip. At the beginning of the week, we Canadians had a team-building activity called the Cuernavaca Quest. This quest was a sort of scavenger hunt. We were divided into teams that each received a list of five items to purchase with sixty pesos, the salary of a poor Mexican and a little less than $5.00 CAD. We were also given instructions to shop at only two places: the MEGA Supermarket (a Walmart equivalent) and the People’s Market (a flea market where the poor sell goods at vendor stands). We set out to purchase our five assigned items including: 1 kilo of rice, 1 kilo of green tomatoes, 1 kilo of tortillas, “1-2-3″ cooking oil, and one roll of toilet paper. My team and I began at the MEGA Supermarket. We searched throughout the store and price-checked the items. Ultimately, we decided that it would be best to purchase the cooking oil and toilet paper there, but that we could get the food items for a better price at the People’s Market. There was one problem though and that was that toilet paper was not sold individually, but only in quantities of at least four rolls. I suggested that we buy the cheapest four-pack and then use the remaining three rolls in excess of what was required to buy another item on our list. My teammates laughed initially, but agreed that it was worth a try. 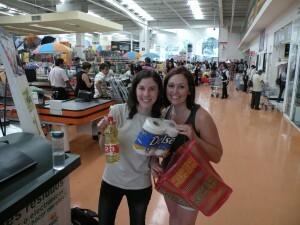 We purchased the four-pack of toilet paper and the “1-2-3″ cooking oil and then set out for the People’s Market. When we arrived to the market, we found some young women selling tortillas. Our time and money were limited and so we bargained with them. It was mildly difficult to bargain with the poor since we likely appeared as though we could afford the cost. Eventually, we settled for a little less than a kilo of tortillas according to our tortilla budget. Next, we strolled throughout the People’s Market in search of green tomatoes. Almost everywhere the tomatoes were being sold for six pesos. I then insisted that my teammates put away their cameras since it would not likely go over well to haggle while holding digital cameras. Eventually we came upon a woman selling green tomatoes. We explained that we did not have very much money to spend and would she trade a kilo of tomatoes for two rolls of toilet paper? She shook her head to that offer. I pulled out a third roll of toilet paper, desperate to seal the deal. She lit up and with three rolls, we had a deal! By selling the rolls, we gained money back that we had spent on the four, making the earlier expense cheaper and we acquired another needed item. She was pleased with the exchange because she thought that the value of three rolls of toilet paper was greater than the price of her tomatoes. The last item that we had to buy was the kilo of rice. We only had ten pesos remaining. 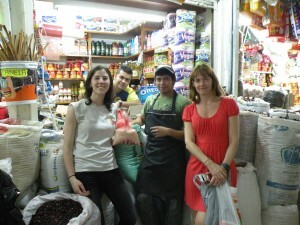 Everywhere that we went we found that a kilo of rice was being sold for twelve pesos. We must have had our offers refused at a dozen different kiosks. Finally, we came upon some young men with rice for sale and asked how much. They said, “Eleven pesos.” We were delighted. Would they take ten? Sure. I commended them on their fine business skills and informed them that they had made the sale because of their ability and willingness to be competitive. My team and I had accomplished the Cuernavaca Quest! I was filled with enthusiasm and pride at our success. The activity, I thought, had been a terrific lesson in capitalism, voluntary trade, subjective valuation, creativity, ingenuity, and entrepreneurship. Once all of the teams regrouped, we debriefed the quest. The rest of the group thought that they had succeeded at the activity by failing, as if the purpose was to realize that it could not be done and that needs could not be met with the low daily wage. Initially, everyone found our idea creative, but soon became frustrated. They accused me of coming up with a solution that was beyond the abilities of the poor. They argued, “It is very hard to think like that. These people do not have the university education that you do.” I insisted that the poor are even more inventive than I was this day and that they are already doing what I did on a daily basis to support their families. “Necessity is the mother of invention,” I insisted. The group argued that the poor do not have time to think of making a profit, but only of spending their daily sixty pesos. That is no way to break the cycle of poverty, I thought. And the barter system certainly preceded university education. This entry was posted in Activism, Ordered Liberty, Political Commentary, Travel by Amanda Achtman. Bookmark the permalink.